The holidays are a beautiful time of year, a season dedicated to expressing your affection for someone or at least your affection for commerce, but regardless of how you celebrate the holidays, there’s no escaping the phone calls to family. For some people — including me — calling the family is a pleasure that often leads to fun and laughter. For others — and this seems to be the majority — calling the family is a task to be dreaded. If you’re in the latter group, you don’t need to be adding up phone or data charges while listening to lectures about not calling often enough. So I’ve got a little surprise for you — call it an early Christmas present. When you and your family are on Voxox, all of your communication to each other is free! This means unlimited free calls; free texts; location, contacts, image and video sharing; and faxing. Voxox is a free app that runs over the top (or OTT) of your regular cell phone service plan. When you call or text your family from the Voxox app, your voice or message is being carried over the Internet, rather than over traditional telephone lines. This is called voice over Internet Protocol or VoIP for short. You’ve probably heard of it. It’s because of VoIP technology that Voxox is able to give you free calls and free texts in-network — with no pop-up banner ads! Sometimes getting your whole family to buy into an idea is a bit like herding chickens. Everyone wants to go in a different direction. But adding a free app such as Voxox is much easier than trying to get them all to switch to the same cell phone service provider. With Voxox, there are no contracts to sign and no commitments. You get a free phone number and numerous additional features you won’t find in any single app. Find out more about those by reading the blog post entitled: Top Seven Reasons to Use the Voxox Mobile App. Inviting your contacts to join you on Voxox couldn’t be any easier. Simply go to anyone’s contact screen in your app (they’re automatically imported when you sign up) and tap on the “Invite to Voxox” button. An invitation is automatically sent along with a link to the free download. 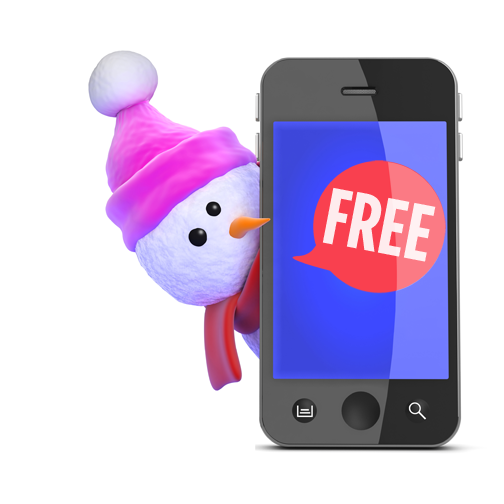 As each family member signs up, you can start sending free texts and making free calls immediately! In reality, the holidays are still two months away, so technically you have a month and a half before panic sets in. You can make the season happy for yourself, your family and friends by staying connected, whether by free texts, free calls or just by sending a quick photo or two. Make the most of your holidays by using Voxox for all of your important communication.